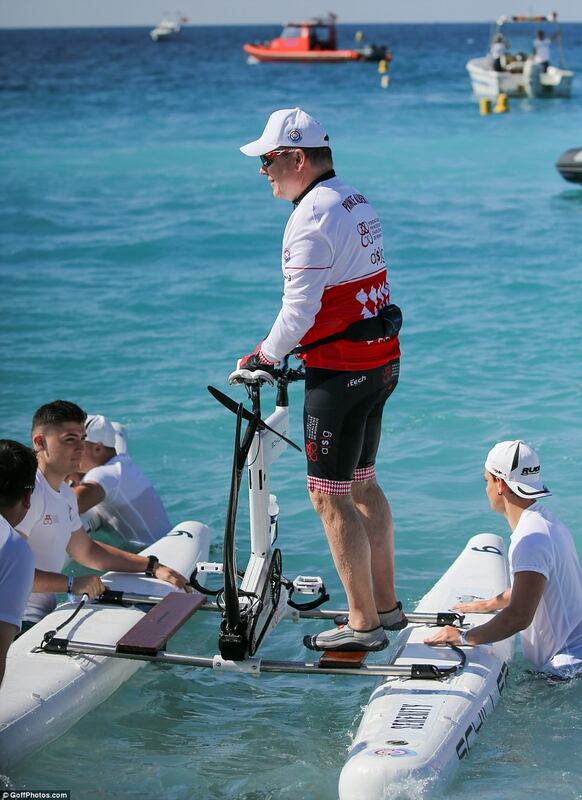 Prince Albert of Monaco slipped into his Lycra as he joined Formula 1 legend Nico Rosberg for a gruelling charity water bike ride. 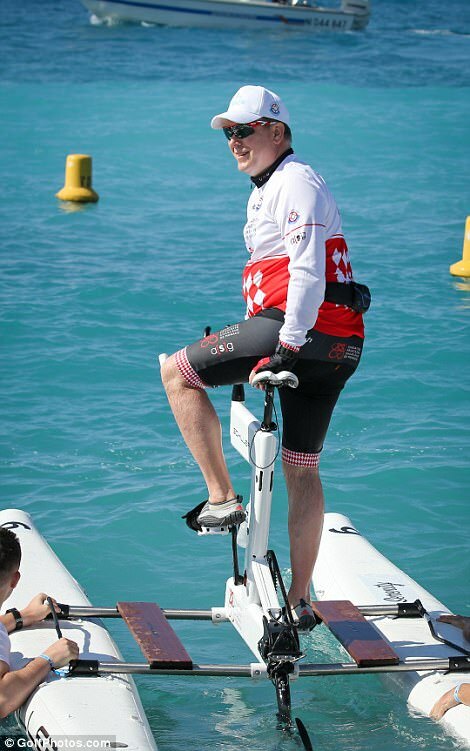 The 59-year-old royal was in high spirits as he participated in the Riviera Water Bike Challenge, peddling 21km from the beach of Nice to the Yacht Club of Monaco. Prince Albert joined 10 teams of five people to participate in the competition, including famous athletes such as German Formula One World Champion, Nico, and South African former rugby player, Percy Montgomery. 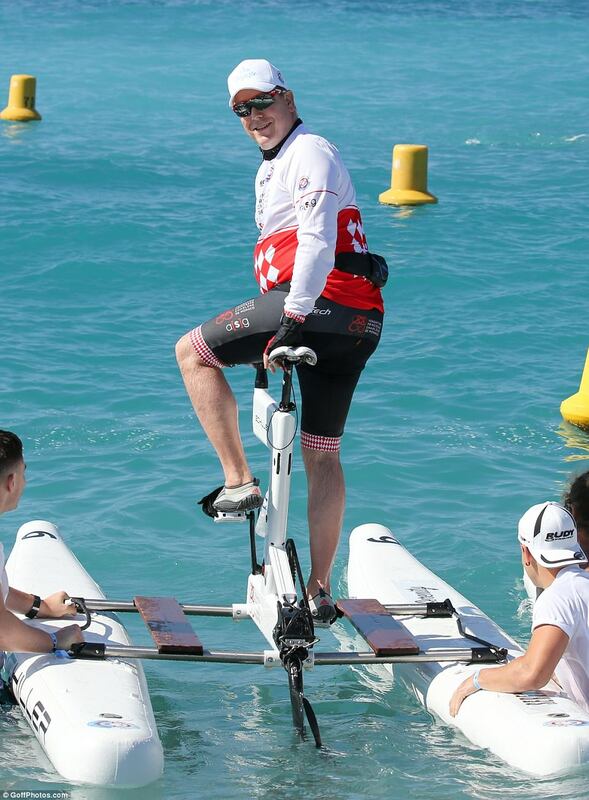 The athletes will make the 21km journey between Nice and Monaco on Schiller S1 water bikes. 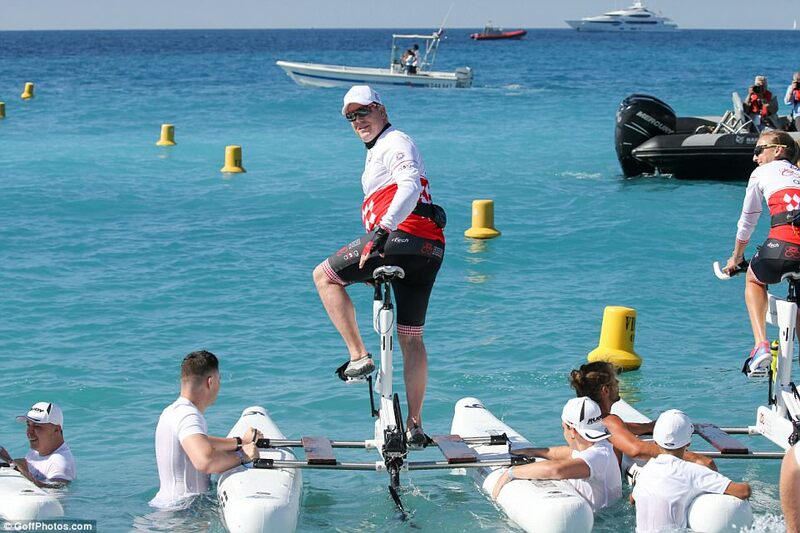 Highly regarded as a world premier sporting event, the challenge is held in support of the Princess Charlene of Monaco Foundationto support the foundation’s work with children. There were two sports personalities peddling on each team, plus two places available for amateurs, which were selected by raffle last month. 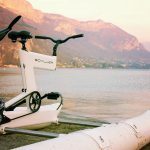 According to Hello Monaco, the water bike was developed by American Judah Schiller reportedly as a dare. 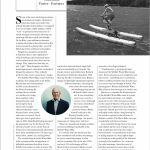 It uses an optimised propeller, proprietary gear box and Gates Carbon Drive belts and can reach an average speef of 10mph in calm waters. Prince Albert’s appearance at the race comes after he joined Princess Charlene, 38, to watch the Monaco Grand Prix last week. Former Olympic swimmer Charlene, who married into Monaco’s House of Grimaldi in 2011, dazzled in a fitted scarlet dress as she presented the trophy to this year’s winner Ferrari driver Sebastian Vettel. Wearing a sleeveless red checkered dress, the princess wore her short blonde hair parted to the side and kept her make-up understated apart from a bold lip. She tactfully kissed runner-up Kimi Raikkonen, of Finland, who came second to his Ferrari teammate, before presenting the winner with the trophy. Before the race begun, the princess and prince were photographed on the race track speaking to the staff behind the teams. Princess Charlene met her future husband at a French swimming event in 2000. Originally from South Africa, she shot to fame in the late 1990s for success in the Olympics. Over the years Charlene has become well-known for her elegant fashion style, after wearing an exclusive Armani dress to her wedding. Today the royal duo looked the epitome of stylish, with Prince Albert II donning beige trousers and a smart blazer, shirt combination.